Prepare yourself for the ride of your life. Lower Class is a mind-bending machine inspired by diverse in-depth thinking and pure attention to detail. I met Mark Graham and his partner Tracey ‘Tufty’ Brett at the VFM Southport custom show when Mark was showing Lower Class had been attracting a vast amount of attention and won Best Engineering and Best in Show. Two weeks later at the VMSC Extravaganza Lower Class won Best Street Racer, Best Creative Engineering and Runner-Up Best Custom Vespa. 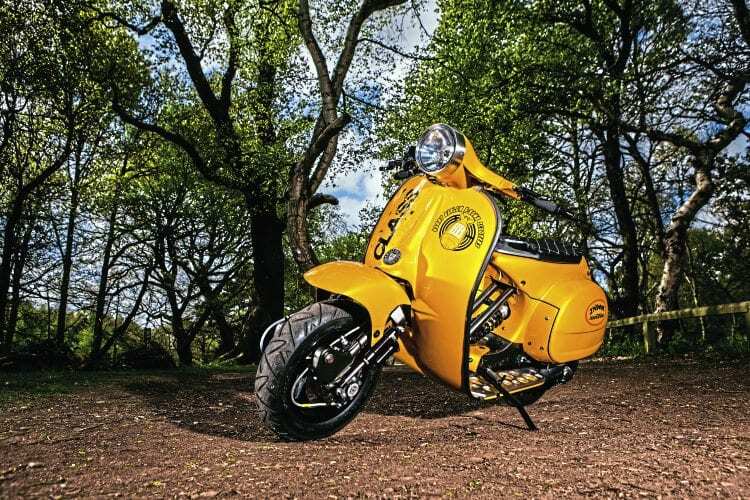 Two weeks after that it won Best in Show at Scarborough, and then Best in Show and Best Vespa at the Bangers ‘n’ Mash do the week after! 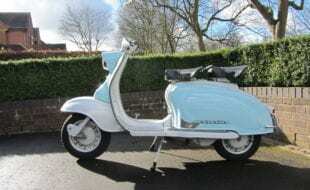 Mark Graham is well established in the scootering scene and previously produced ‘The Business’, a scooter with fantastic paintwork based on the 2005 Danny Dyer movie. Spec and name plate is a nice touch. Mark’s inspiration for Lower Class developed from a passion for European street racers, and as you can probably imagine when Mark is passionate about an idea he doesn’t do things by half. At first sight you’d be forgiven for thinking that Lower Class had been developed by a team of aeronautical engineers. SIP speedo looks right at home. 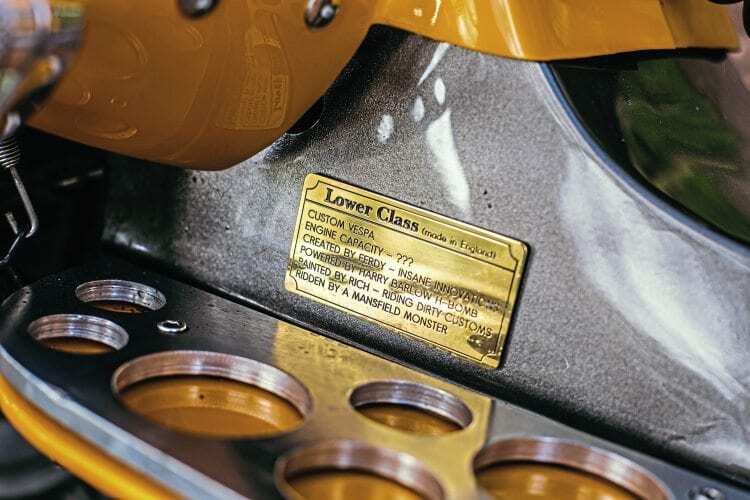 The secret of Lower Class’s success is that it has been built by a unique blend of skilled and experienced individuals who’ve worked with Mark to produce a thing of beauty. 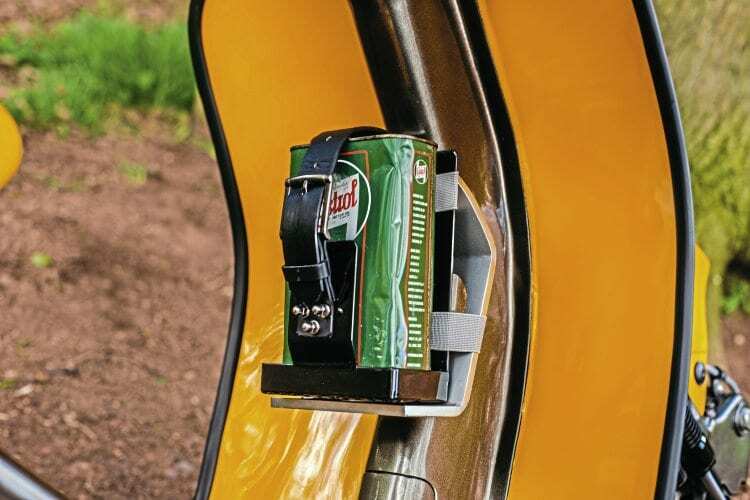 When you get up close to Lower Class you realise that it’s filled with unseen special elements, the more of which seem to emerge the more attention you pay to the machine. It’s almost addictive – like a drug. Some of the names previously considered were; ‘No Nonsense’, ‘Misunderstood’, ‘Kicking up a Storm’, and ‘Understated’. Mark explained that the name ‘Lower Class’ encompasses the situation completely. Put simply; Lower Class has a lowered riding position and profile, and was born out of a gritty, working-class approach to the project. Mark secured the services of Ferdy to handle fabrication and the overall build. Richard Coveney at Riding Dirty Customs would take care of paintwork. 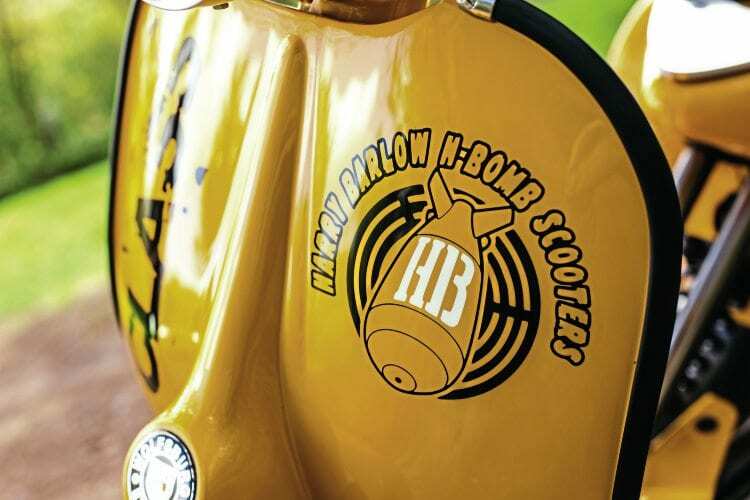 H-Bomb Scooters would manage engine development and Pro-porting would take care of tuning. A pretty impressive team. 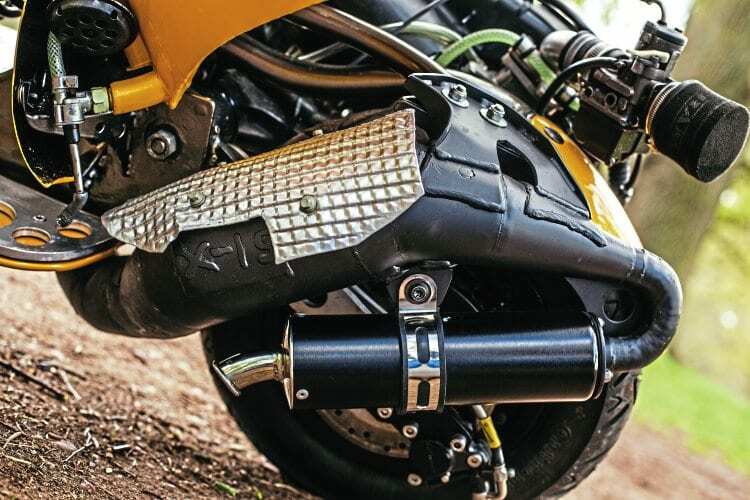 Exhaust looks well, but is 22hp enough? However, after further consideration Mark moved away from the race plaque idea. He decided that as long as he’d got the name Lower Class in its present form on the machine he’d be happy and he allowed Richard a free reign. Lower Class started life as a simple Vespa P-range frame, which has now been transformed into a masterpiece. 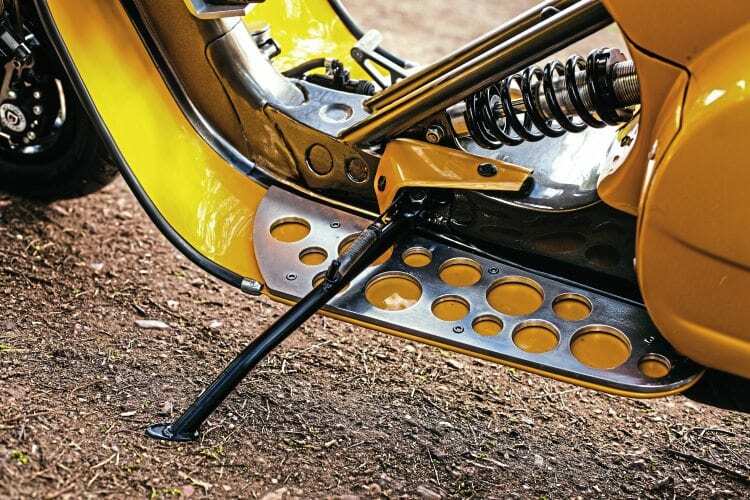 The double struts extending from the main-frame to the sub-frame add strength and the upgraded adjustable shock absorber assist stability. 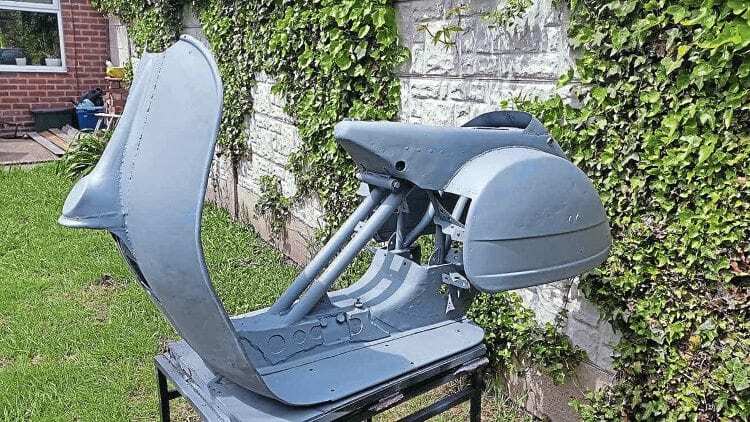 Initially, a Vespa Rally front mudguard was used but it after some investigation it was decided that it didn’t sit right and so a fabricated P-range mudguard was used. 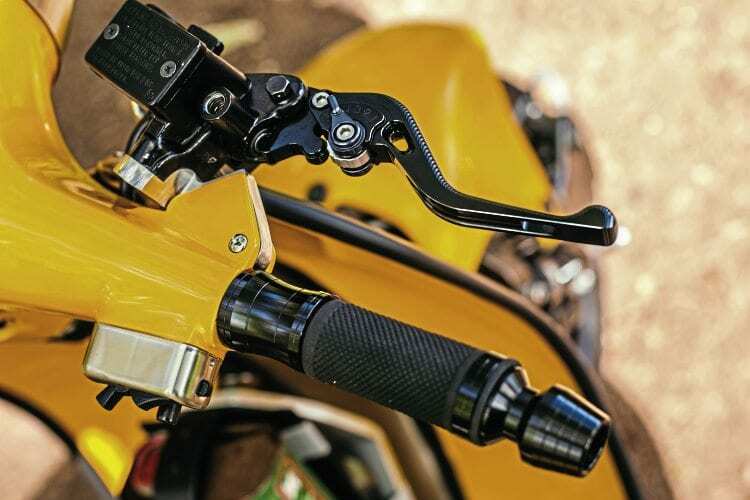 The leg shields were cropped just below the headset, which allowed for a lower position. 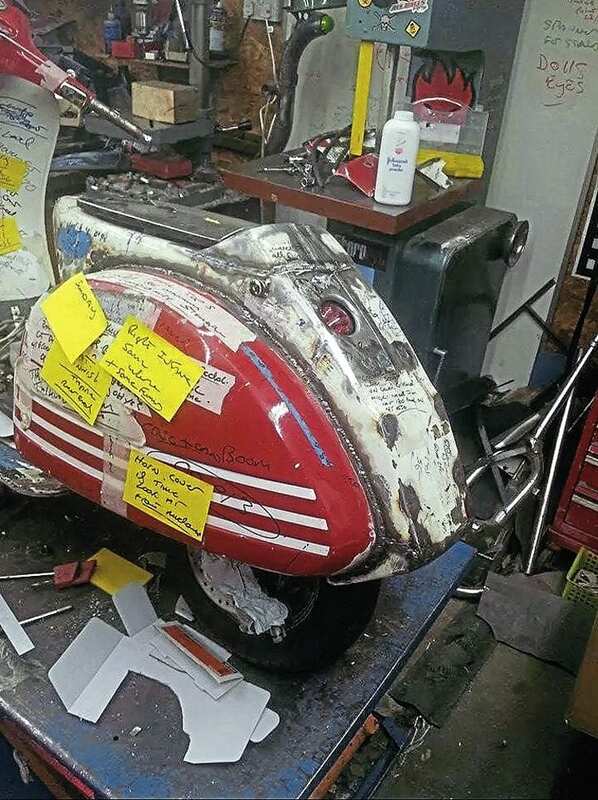 The Lambretta forks were racked and the stem was taken down. 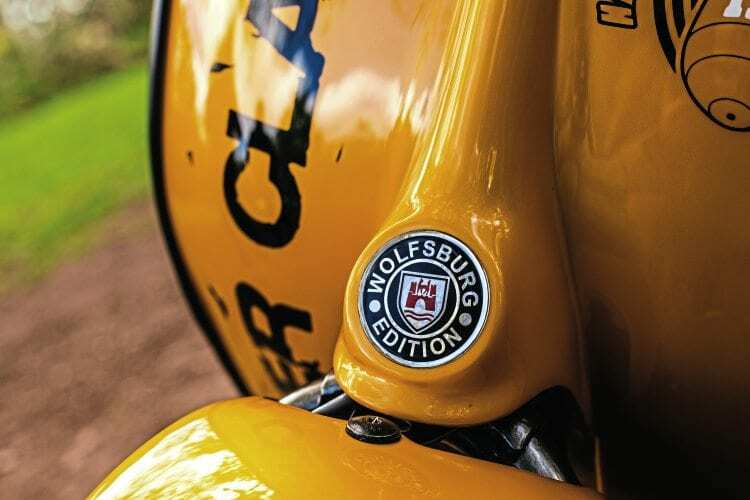 The Rally headset coupled with the GS horncasting gives a vintage appeal and provides smooth clean lines, which are easy on the eye. 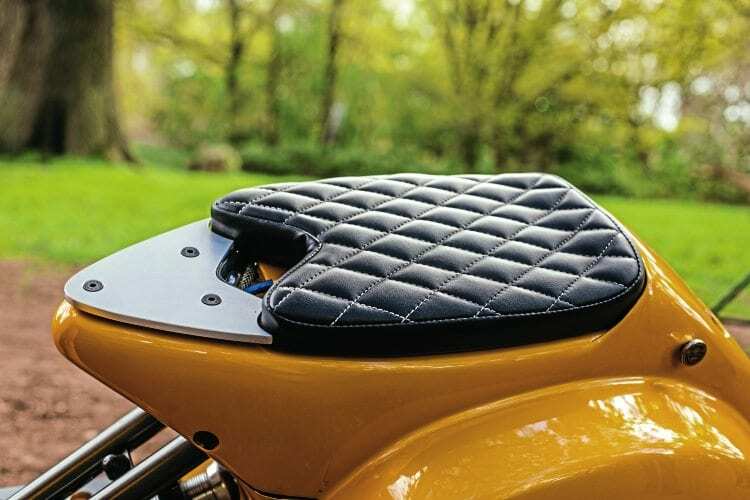 Custom seat is perfect in its fit and style. Mark also showed me the Lower Class build photographs, which showed Ferdy’s build points and ideas written on the machine, and on post-it notes attached to the machine! Pull the release catch and the back end gently rises in a graceful flow to reveal an engine of elegance and beauty. 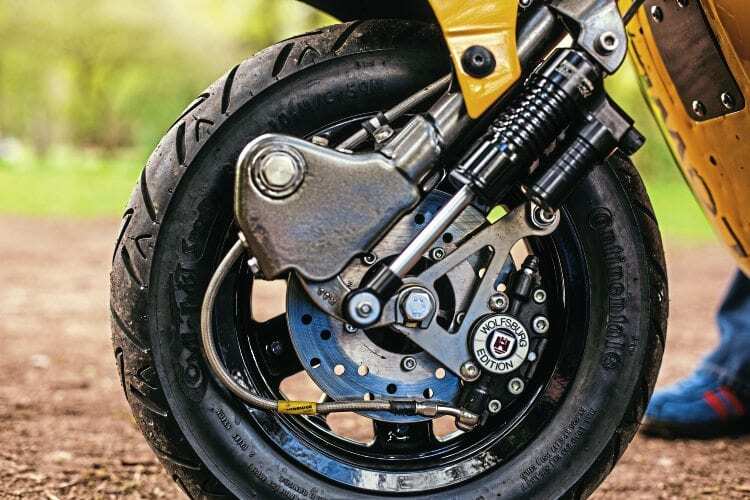 Stopping power and handling in full effect. 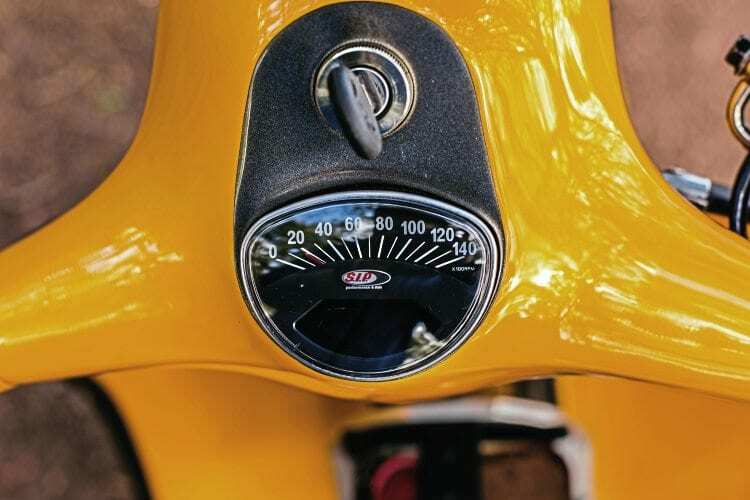 The once standard P200E engine is now a Malossi 210 with profiled cylinder head, and 28mm Dellorto Carb’, which is supported by a fuel pump and reed-valve. 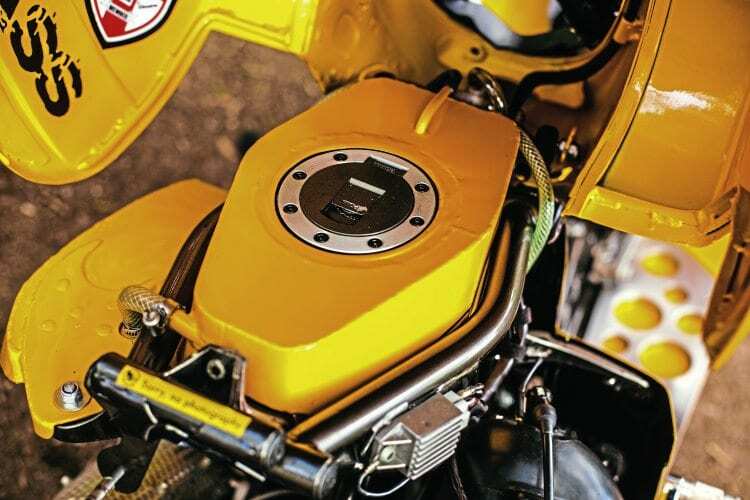 It also has a tuned crank and HP4 flywheel. Gases are turfed out through a JL exhaust, which has been flipped and has a one-off PM end-can. 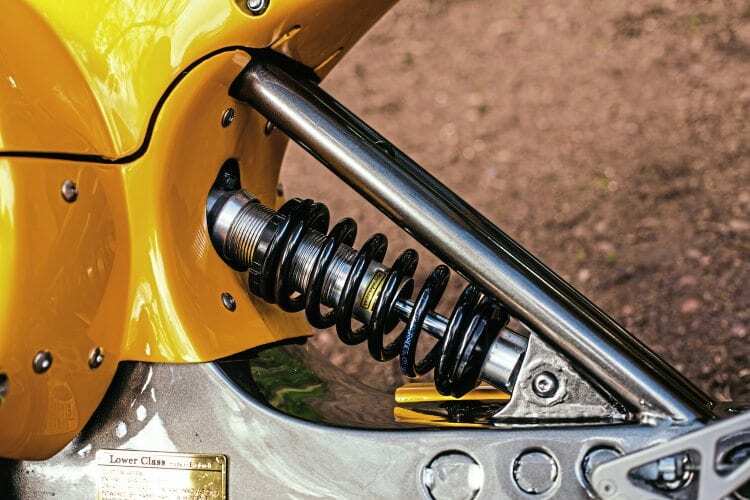 Could this suspension setup look any better? No. Mark agrees that if the exhaust were to be swapped out for a higher performance part Lower Class would probably gain an additional 4hp, but he says installing something off the shelf like that would have compromised the overall look of the machine and Mark simply wasn’t prepared to do that. After all isn’t 22hp enough? It goes like stink. H- Bomb providing the power. Lower Class’s lines are smooth, they aren’t disturbed by joints and unnecessary additions. Lower Class was built by a team of experts with clear judgements and decisions unclouded by egos or their own agendas. Mark’s walked into the unknown and he’s taken risks in areas where some of us would fear to tread. His desire to produce something new and radical has paid off. My interpretation of Lower Class is simple: the detail is in the build, the build is in Lower Class and Lower Class is truly compelling. Thank you Mark for your openness and thank you for sharing such fine grain, and previously undisclosed detail with us. Scooter club & town: Mansfield Monsters SC. 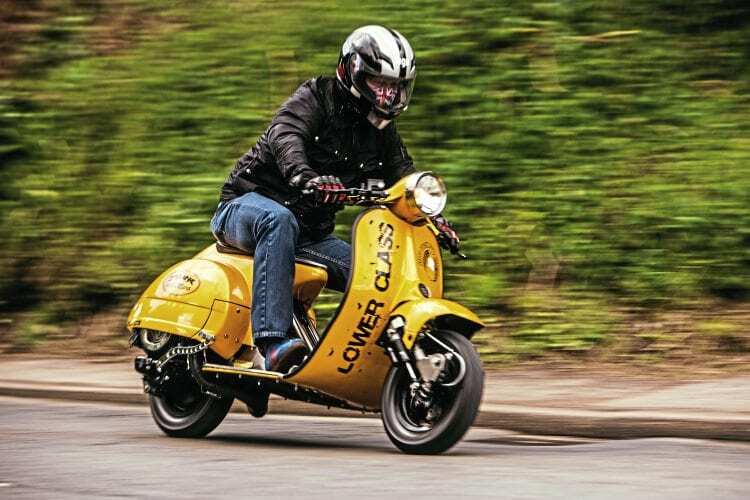 How and when did you first become interested in scooters: When I was about 10 years old I became obsessed with watching the older lads riding about through town on their scooters. 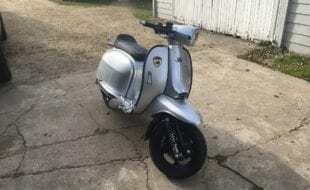 What was your first scooter: Vespa T5 Mk 1. 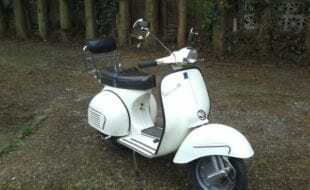 What is your favourite scooter model: I like all models of Vespa and Lambretta. 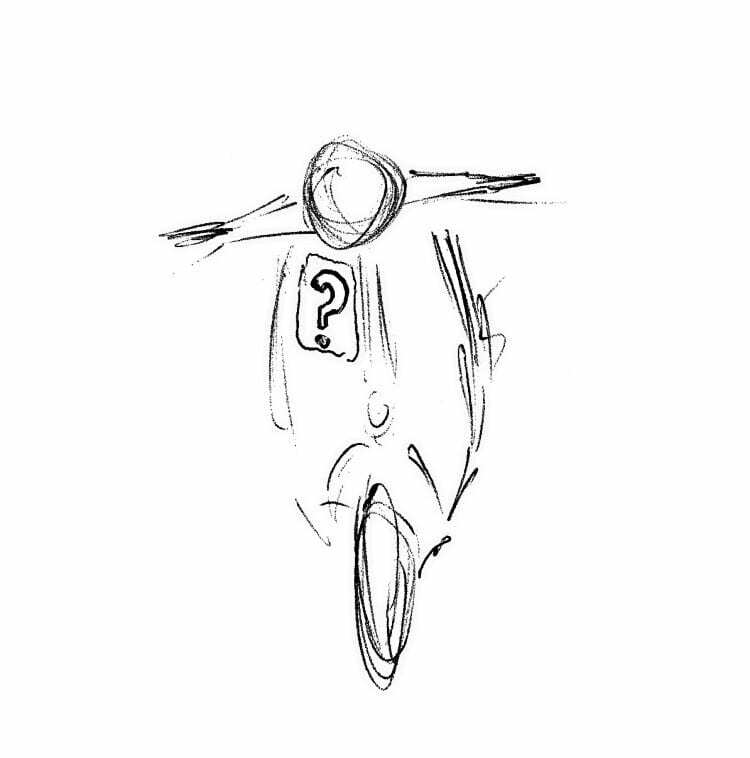 What is your favourite style of custom scooter: Custom scooters with attention to detail and where the theme flows with everything else i.e. chrome/engraving wouldn’t have gone well on Lower Class. 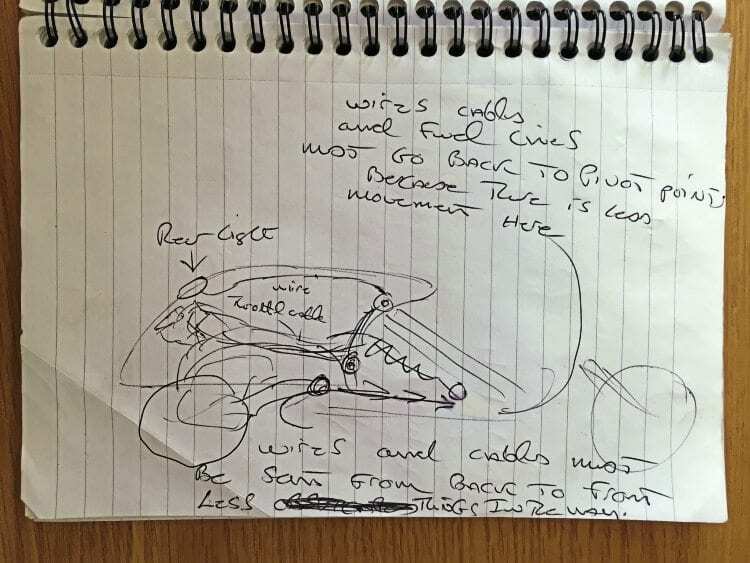 First rally or event: Cumby Arms/Darlington SC 2002. How did you get there: By scooter. Any stories: Stories are for kids. Favourite and worst rally/event: Not really ever had a bad rally. It’s about being with good people and with friends, which make it what it is. 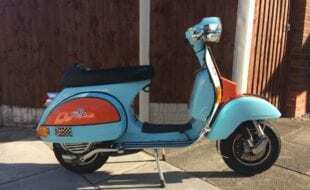 What is your funniest experience with a scooter: Too many to list. 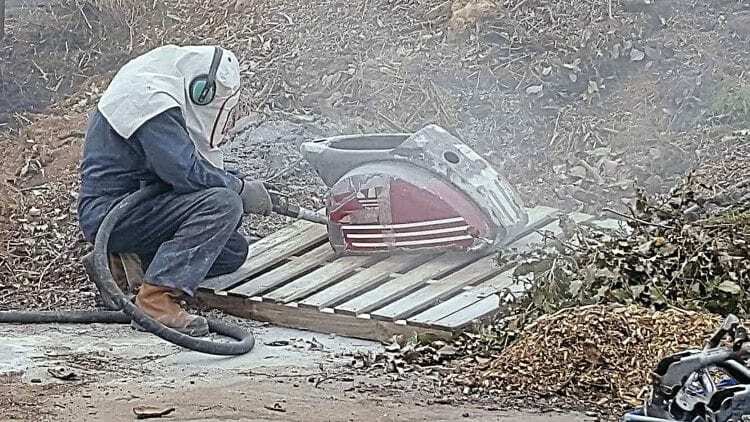 All scooters have their days, at the time you want to throw them off a cliff. It’s when you look back at what happened it becomes something to laugh about. What’s the furthest you’ve ever ridden on a scooter: Hartlepool to the Isle of Wight and back (Gary Powell left me on the way home!) 2008. What do you like about rallies/events: Getting together with like-minded people from all over the UK and Europe, and getting home safely. What do you dislike about rallies/events: Non scooterists trying to make a quick buck out of something they know nothing about by putting on festivals with poor bands. 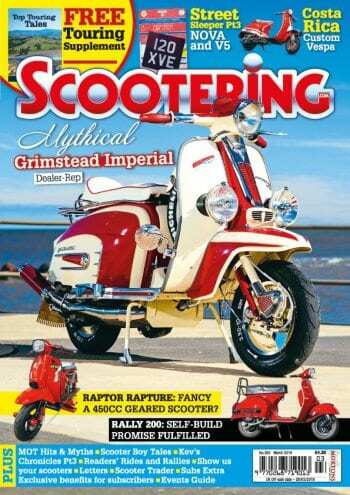 What’s your favourite Scootering magazine feature: January 2007 issue, ‘The Business’ with my scoot on the front page! 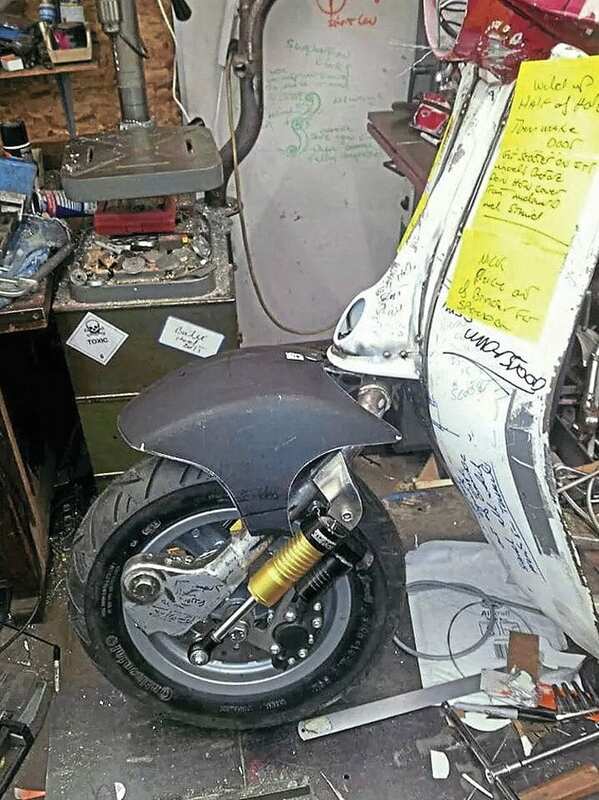 Your favourite custom/featured scooter of all time: I like and appreciate the hard work that goes into all custom scooters, so I don’t really have a favourite. 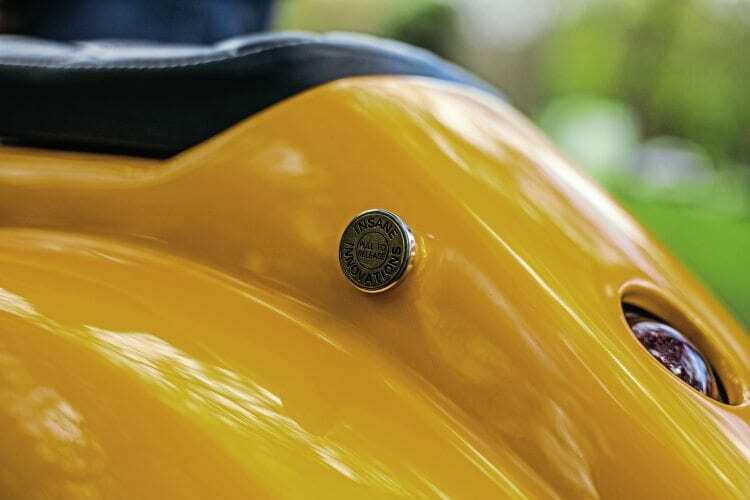 If you had to recommend one scooter part or item of riding kit what would it be: A good breakdown tool bag or membership card. 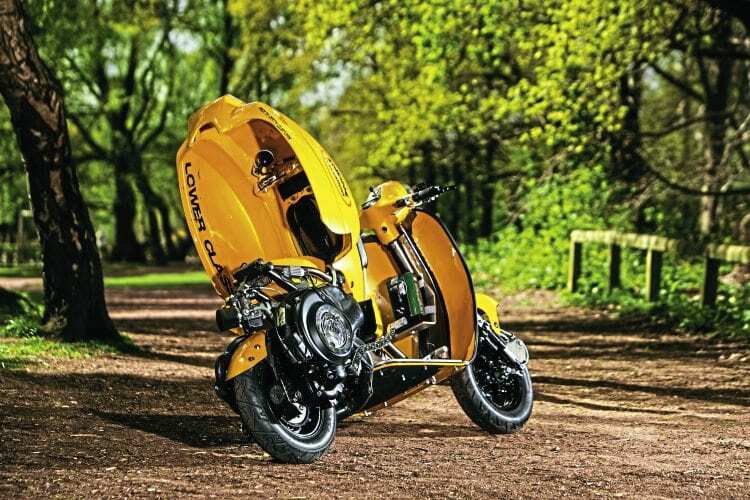 What’s the most useless part you’ve ever bought for one of your scooters: A CDi cover. It lasted about two minutes after shutting the back end down on Lower Class. Name of scooter & reason: Lower Class. Because it’s low and it’s class. Date purchased & cost: Frame and engine bought separately in 2012. Inspiration for project: I’ve always liked street-racers inspired by European styles. Time to build & by who: The full project was roughly about four years from start to finish by Ferdy at Insane Innovations. 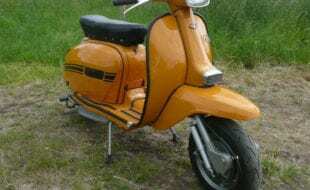 Once it was back from the painters it took Ferdy and I two long weekends to rebuild it. Any specialised parts or frame mods? What & by whom: All specialised parts done by Ferdy at Insane Innovations. Engine spec: Kit: 210 Mallossi/reed valve/hp4 flywheel/Vacuum fuel pump. Crank: Harry Barlow pro-porting crank. Carb: Dellorto 28mil. Exhaust: Hand-made from JL with a PM end can. Clutch: Cosa. Porting work by: Harry Barlow Pro-porting. 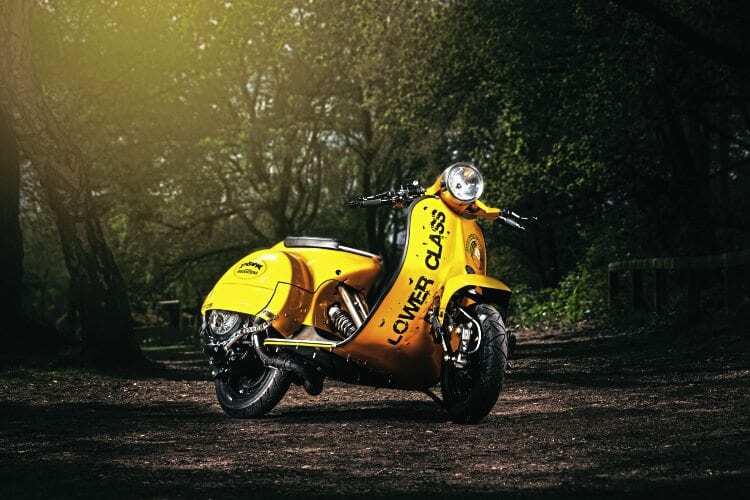 Describe engine performance, power delivery and scooter handling: The engine performs very well. 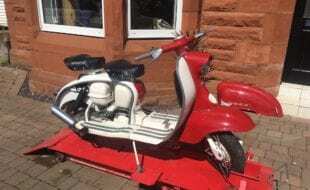 It does hold back a little due to the exhaust but I think 22bhp is enough for a road going scooter. 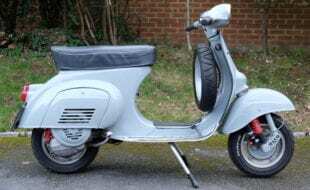 It handles beautifully having the centrally located damper and the Lambretta forks have been raked so it isn’t sloppy. 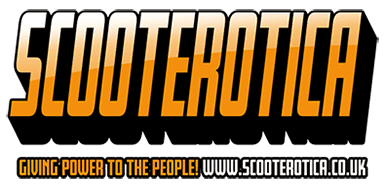 Is the scooter reliable: As reliable as a scooter is expected to be. Paintwork & murals done by: Rich Coveney at Riding Dirty Customs. 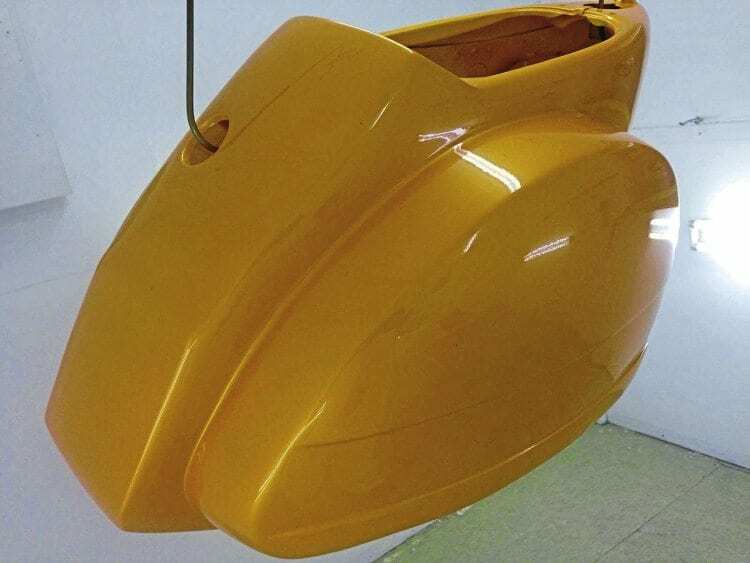 Is there any powder coating: Powder coating all done by Romax, Stockton. Anodising – Matt Tomlinson. Overall cost: Answers on a postcard please. What was the hardest part of the project: Getting everything to fit properly once Rich got his paint on it. 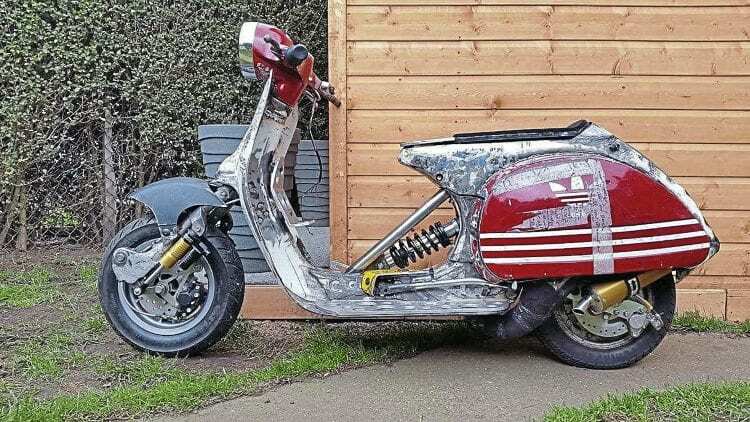 In hindsight, is there anything you would have done differently: I would have insisted that Ferdy just Frenched the rear end and put a set of drop bars on it. Is there anyone you wish to thank: Ferdy for the whole project. Rich at Riding Dirty Customs for sticking to his agreed time-scale. H-Bomb Scooters for developing a reliable engine and all the other technical bits. Matt Tomlinson, Snooty, Wigan Tim, Mike Phoenix, Romax – Stockton, Camcoat – Warrington, Keith Newman, Daz Turner, Steve Goodfellow and my long suffering partner Tracey (Tufty) Brett.